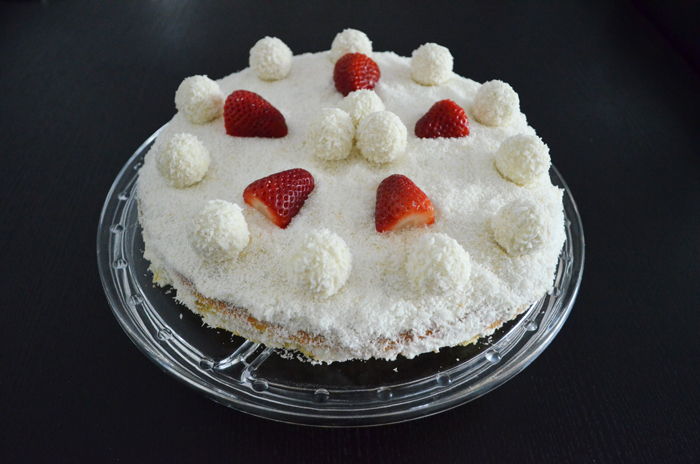 Recipe: Easter Lamb: a different Raffaello-Strawberry Cake – Recipes. Simply delicious. Easter is this week! 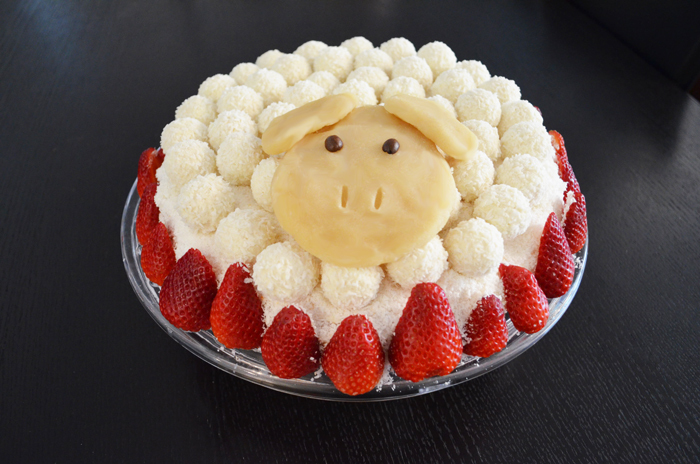 It’s not easy to find visually pleasing and tasty food that has an Easter feel to it, so we decided to take a classic and delicious Raffaello-Strawberry Cake and transform it into a cute Easter lamb. ☺ If you’re planning not to concentrate on the Easter Bunny and Easter Eggs theme, but on the original theme here is an easy recipe for something totally yummy: have fun with this Raffaello delight. Outside of Easter, the Raffaello-Strawberry Cake in its original form is easy to make and remains just as delicious: a wonderfully creamy dessert and an impressive cake for on the coffee table. Separate the eggs and beat the egg whites with the salt to stiff peaks. In a separate bowl beat together the egg yolks and ½ cup of the sugar until foamy. With a spoon, carefully fold the egg whites into the egg yolk foam. Finally, stir in the flour, cornstarch and baking powder, a bit at a time. Put 14 of the Raffaello balls aside for the decoration and cut the rest of the balls into small pieces. Wash the strawberries and set about 10 of them aside also for the decoration. Cut the rest of the strawberries into small pieces. Now beat 1 ¼ cup of the whipping cream together with the vanilla sugar and 3 tsp. granulated sugar until firm peaks form. 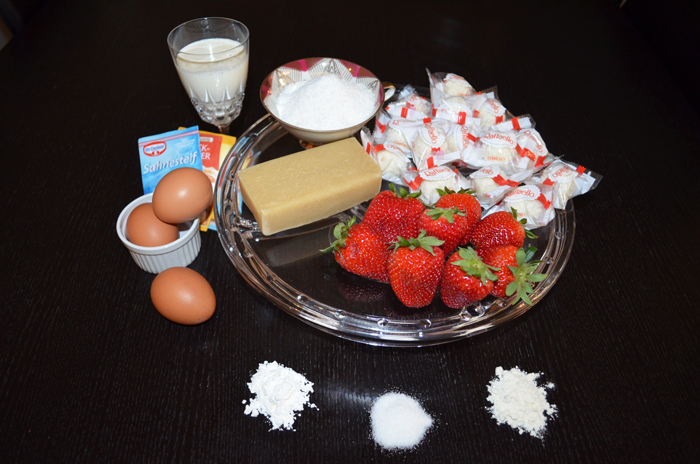 Carefully mix in the Raffaello and strawberry piece and your filling is ready. 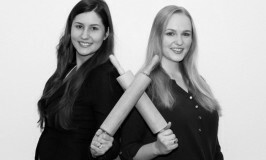 Spread the Raffaello – Strawberry Filling onto one of the cake layers and carefully place the other layer on top. Whip the remaining 1 ¼ cup of whipping cream to firm peaks and cover the cake with it. Roast the grated coconut in a non-stick pan on high heat for about 2 minutes, stirring continuously so they don’t get to brown. Sprinkle the coconut evenly over the whole cake. Place 3 Raffaello balls in the middle of the cake and place the rest evenly around the top edge. Cut the strawberries in half and lay them in between the Raffaello balls. For the Easter Lamb, do the exact same as for the normal cake, just without putting the strawberries on top of the cake. Instead, cover the whole top of the cake with the Raffaello balls. Create the head and ears of the lamb with the marzipan. Have a look at our picture to see the shape of the head and ears and it should be pretty easy to make. Make the eyes with the coffee or chocolate beans and with the end of a tea spoon make the nostril indents. Now just place the head carefully on the cake and voilà: the cute Easter Lamb is ready. For the final touch, cut the strawberries in half of lengthwise in slices and place them along the bottom edge all the way around the cake. Now your lamb is sitting on a lovely strawberry field.